Bob the Builder is all about the famous Bob the Builder TV character from the TV show of the same name. Buy a single copy or subscription to Bob the Builder magazine. The monthly UK publication brings to print the adventures of the popular animated character that was created by Keith Chapman. This magazine provides the same philosophical approach as found in the animated television program. The content of the publication focuses on presenting children with the concepts of problem solving, working as a team, cooperating with each other, getting things done, and trying hard. 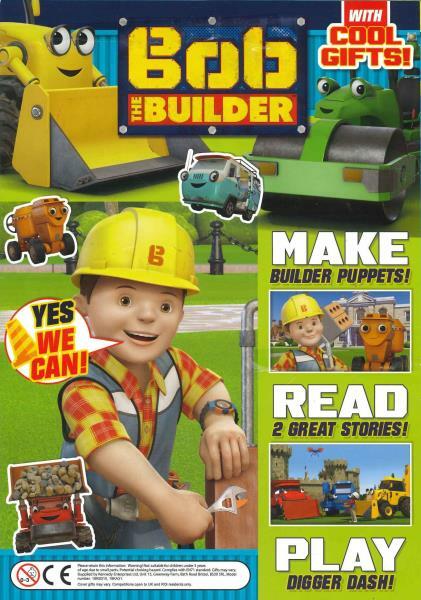 All the fun, stories and games in Bob the Builder Magazine work within the theme of building, construction and machines. You will find all the familiar characters that preschool children recognize and love in the Bob the Builder Magazine, including Wendy, who is his business partner, Pilchard the Cat, Farmer Pickles, Travis the tractor, Spud the Scarecrow, Sumsy the forklift and Packer the Truck. Bob lives in Bobsville with his machines and his cat. Fantastic! The magazine is as positive as the cartoon. My 2 1/2 year old grandson loved it even though some projects are for older children. Will hold onto them so he can revisit some pages when he's the appropriate age. I send this to our 4 year old grandson in Canada, who goes everywhere in a yellow hard hat and is greeted in the local supermarket as Bob. It helps him learn numbers and letters and many other skills. I highly recommend this, so does our own little Bob. Really enjoyed this magazine with my 2 year old son. Workbook very simple and easy to understand for toddlers. EXACTLY what i was looking for!